Over easy refers to an egg that's fried and flipped just once. The yolk remains delectably runny, making it an ideal accompaniment for bacon, sausage and toast. Over-easy eggs also make a tasty filling for an egg sandwich, a topping for a decadent burger or a rich addition to cheese grits. 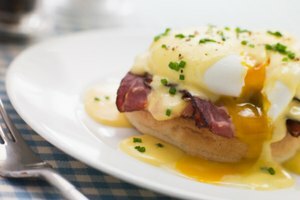 Enjoy this popular diner style of egg cookery at home with minimal equipment and by mastering a few simple techniques. 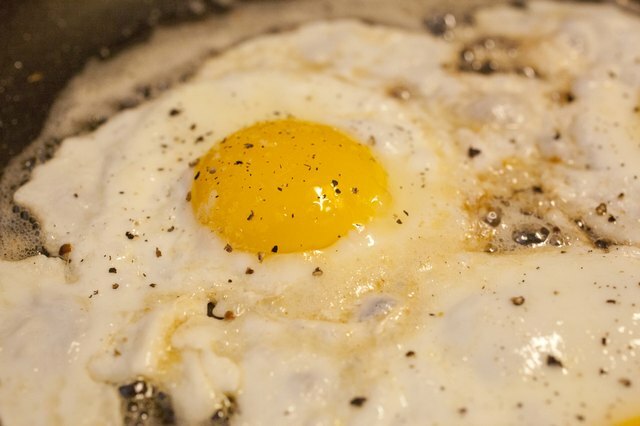 A non-stick pan and a pat of butter aids you in proper egg frying. Simply place the pan over medium heat and melt the butter. Alternatively add cooking spray or a drizzle of cooking oil, such as coconut or olive. 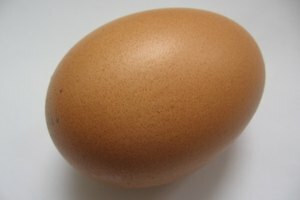 Crack a fresh egg into a small bowl. This keeps the egg compact and prevents the whites from spreading uncontrollably. Once the butter melts or the oil is hot, pour the egg gently into the pan and sprinkle with salt and black pepper to taste. When the white of the egg looks opaque and the edges start to curl away from the pan -- about 4 minutes later -- it's time to flip. Slide a non-stick spatula underneath the egg and, in one quick movement, turn the egg over. 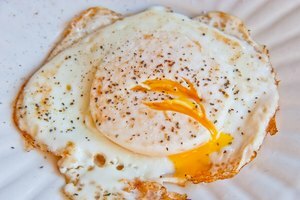 Allow the egg to cook a minute or two longer -- or until the yolk is cooked to your liking. Test the yolk's doneness by gently pressing with your finger; a runny yolk feels quite soft and jiggly. Choose a thin spatula so it slides easily under the egg without breaking the yolk. Also make sure the spatula is completely under the yolk before you attempt to flip. If the spatula is just supporting the white of the egg, the heavy yolk is likely to break and ooze all over the pan. Slide the spatula under the finished egg and flip one final time before sliding it onto a plate. 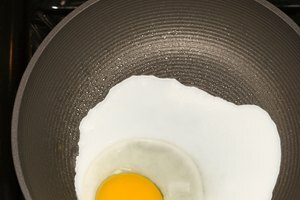 A non-stick pan is a surefire way to prevent the egg from sticking, but it's not your only option. A seasoned iron skillet also deters an egg from sticking. A regular stainless steel or enamel pan works as long as you add a plentiful amount of oil or butter and allow it to come up to a moderately high temperature before adding the egg. You know it's the right temperature if the egg starts to bubble lightly when added. If the oil isn't hot enough, the egg will stick. Don't overheat the pan, though. If the oil is smoking, the bottom of the egg will cook before the white sets, which makes flipping successfully almost impossible. If you desire perfectly round over-easy eggs, use silicon or metal rings that sit right in the pan. Crack the egg into the ring and pull it away once the white sets. Flip and cook to the desired level of doneness. 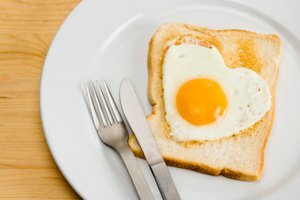 The Centers for Disease Control and Prevention recommends cooking over-easy eggs until both the yolk and white are set. This reduces your chances of becoming infected with the foodborne bacteria salmonella. If you like your egg yolks runny, seek out pasteurized eggs, which are heat treated so all dangerous bacteria is nullified and they are safe to eat raw. 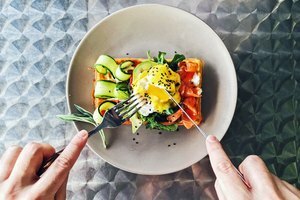 Young children, the elderly and those with weakened immune systems are particularly at risk of complications from eating undercooked eggs.